Step 1: Stay at the wonderful Payogan Homestay with amazingly gracious host Ketut. You can find this place on Airbnb. It is slightly outside the town of Ubud and is within the complex of Ketut and his family’s home. Ketut makes sure that you are comfortable and well cared for! He also is an excellent tour guide for sights surrounding Ubud. Make sure to ask for his special pancakes for breakfast! Payogan Homestay is not to be missed! 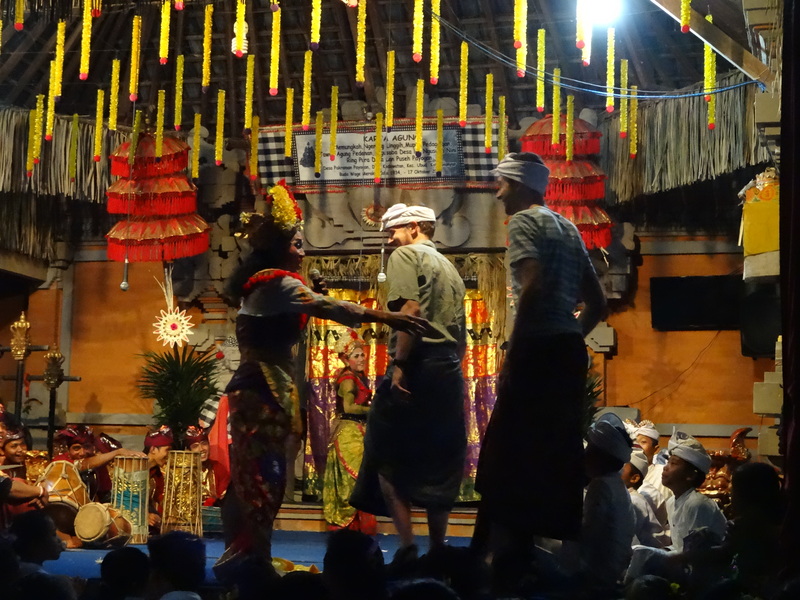 Step 2: Accept Ketut’s invitation to visit his village temple’s “birthday” celebration. 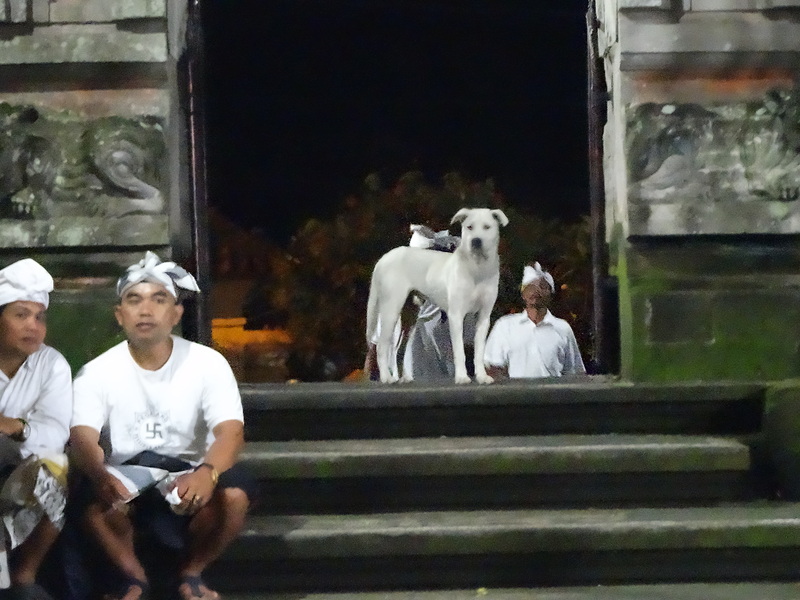 The Balinese calendar has a 210 day year, so every 210 days, the village celebrates the anniversary of the temple. It is an amazing celebration with big processions, tons of offerings, and great music. The celebration lasts for several nights, with a large “dance show” on Thursday evening. Step 3: Dress in appropriate clothes for the temple. This consists of a covering your upper arms, wearing a sarong (for both men and women), wrapping a sash around your waist, and donning appropriate headgear (just men). Step 4: Shyly hang around in the temple for an hour or so waiting for the promised dance performance. Look awkward enough that many of the villagers attempt to make you more comfortable by giving you good seats or letting your sit right next to the orchestra (Gamelan) while performing. 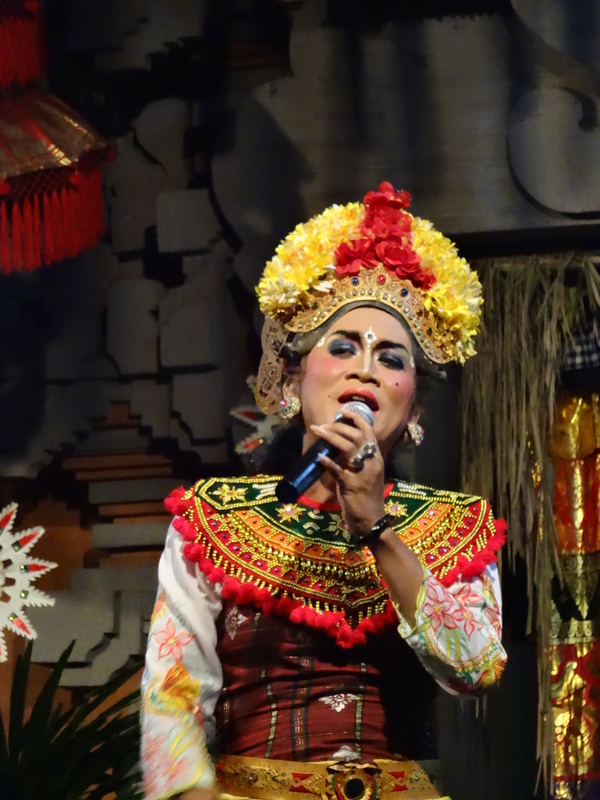 Make sure and enjoy seeing your host Ketut perform, but also make sure to wait for the second Gamelan to come in with very elaborate and fancy instruments: they will add a keyboard, bass guitar, a didgeridoo, and a tambourine to the traditional ensemble. The new band – with a didgeridoo! Step 5: Enjoy the Titanic song My Heart Will Go On as people from a neighboring village process out and Payogan villagers get ready to pray. Step 6: Watch and listen as an entire village gets together to pray and be blessed together. Step 7: Settle back as the promised dance performance finally begins! Step 8: Begin to get a little confused as the dance performance seems to be primarily geared toward humor with two little boys inhabiting costumes of a monster and a monkey playing together. Become even more confused as two clearly male, but dressed as female, dancers comes out and dance quite suggestively before doing an apparent comedy show for the audience. Everyone else will laugh a lot… You will laugh because they are laughing, but will understand nothing. 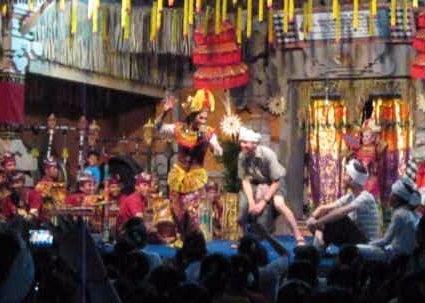 Step 9: Continue to enjoy small snippets of dance and song in addition to the comedy show. Relax as the dancers pick on another foreign couple – asking them a lot of questions. Step 10: Panic when the male of the aforementioned couple refuses to come to the stage and as they spot you in the crowd. Step 11: Think “shucks, I only travel around the world once… YOLO” and approach the stage along with your friend who also thought he was being pointed out, simultaneously. Step 12: Watch your friend learn to dance Bali style which means waving jazz hands, wiggling fingers, and standing on one foot. Step 13: Stand up to learn and perform your part of the dance, which basically seems to be doing a deep squat (frog style??) and hopping around like a monkey… for a very long time. Try not to pass out as your thighs begin to ache. Step 14: Smile as the crowd goes wild! Return to your group of friends and have Ketut congratulate you on a job well done. Wow that was amazing Eric. Who would thought.